Fresh salads and other healthier fast food options made to order. : Located in the middle of downtown Honolulu, this eatery offers fresh salads, soups, sub sandwiches and pita wraps, all customized with local ingredients. Try the popular fresh fruit Aloha Passion salad on mixed field greens with mango, grapes and apples in a passion-orange vinaigrette. 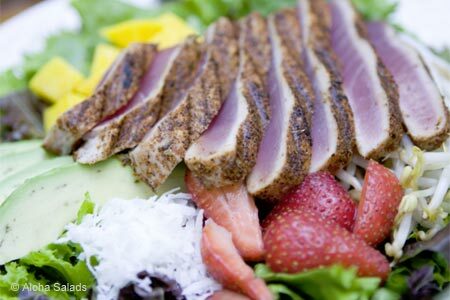 For a twist on the standard ahi salad, order a version made with mixed greens and topped with mango, avocado, coconut, strawberries, green onions and bean sprouts, finished with a mango vinaigrette. If nothing on the set menu catches your eye, you may create your own, salad bar-style. Beverages include a collection of island bottled waters and sodas. Other locations.